His name was John Battaglia, and he died by lethal injection. Asked by the executioner if he had any last words, John Battaglia said "No." But then he changed his mind, looked at his ex-wife Mary Jean, and smiled broadly. Then he said, "Well, hi, Mary Jean. I'll see you later." 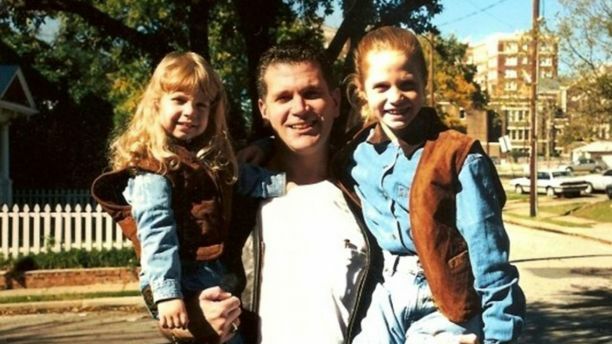 Facing imminent death, John Battaglia continued to taunt his ex-wife, the mother of the two small girls he'd shot and killed in cold blood in 2001; a crime John Battaglia celebrated and embraced until the end. The executioner injected Battaglia with the drug pentobarbital. Battaglia closed his eyes, but a few seconds later opened them, lifted his head, and mockingly asked, "Am I still alive?" Within minutes the lethal drug took effect. John Battaglia fell asleep and began snoring. Seconds later he stopped breathing. 1. He'd see people again. 2. He welcomed his death. John Battaglia should have trembled. In 2001, the man executed today was a successful Dallas accountant. However, he was estranged from his wife, Mary Jean. In an attempt to "get back" at his estranged wife, John Battaglia shot and killed their 9-year old and 6-year old daughters, while on the speaker phone with his wife. According to prosecutors, Battaglia had become angry that Mary Jean had notified police about his harassment of her. John Battaglia used a planned visit with their daughters to act on his anger against his estranged wife. Mary Jean returned a call from one of her daughters and heard 9-year-old Faith pleading with her father. John Battaglia then put the call on speakerphone so his estranged wife could hear what he was doing to Faith and Liberty, their two little girls. Mary Jean yelled into the phone for her girls to run, then she heard gunshots. "Merry ... Christmas," Battaglia told Mary Jean, the words of the holiday greeting derisively divided by an obscenity. There were more gunshots. Mary Jean called 911. Faith was shot three times, Liberty five. Hours later, Battaglia was arrested outside at a tattoo shop where he had two large red roses inked on his left arm to commemorate his daughters. It took four officers to subdue him. A fully loaded revolver was found in his truck, and more than a dozen firearms were recovered from his apartment. Today the biblical understanding of God's wrath has fallen on hard times. It's like it is impossible for God to ever experience righteous anger in the minds of modern millennials. While writing this piece I saw on the television monitor the father of a girl that had been sexually abused by Larry Nassar jump over the courtroom railing and charge the sexual predator in anger. I understood the father's feelings. If you touch my little girl the way Nassar touched over nearly 200 girls, then I might feel the very same emotion that led this father to go after Nassar in anger. "And everyone who commits an offense against one of these little ones who believe in Me, it would be profitable for him that a donkey's millstone would be hung around his neck and he be sunk in the depths of the sea." (Matthew 18:6 Aramaic Translation). That sounds like an angry Father to me. It is a common theme for many to argue that God can't be angry because God is love. I like the way my earthly father puts it. "God defines love, but love doesn't define God." God is more than just love. “But because of your hard and impenitent heart you are storing up wrath for yourself on the day of wrath when God’s righteous judgment will be revealed” (Romans 2:5). 1. God’s wrath is proportional to a person's sinfulness (e.g., "you are storing up wrath"). 2. God's righteous judgment against sin will be revealed in "a day of wrath." “If you say, ‘Behold, we did not know this,’ does not he who weighs the heart perceive it? Does not he who keeps watch over your soul know it, and will he not repay man according to his work?” (Proverbs 24:12). “God’s wrath in the Bible is never the capricious, self-indulgent, irritable, morally ignoble thing that human anger so often is. It is, instead, a right and necessary reaction to objective moral evil” (Knowing God, p. 151). "From his mouth comes a sharp sword with which to strike down the nations, and he will rule them with a rod of iron. He will tread the winepress of the fury of the wrath of God the Almighty" (Revelation 19:15). "Do not take revenge, my dear friends, but leave room for God's wrath, for it is written: "It is mine to avenge; I will repay," says the Lord" (Romans 12:19). "It is a fearful thing to fall into the hands of the living God” (Hebrews 10:31). “Marvel not at this: for the hour comes, in which all that are in the tombs shall hear his voice, and shall come forth; they that have done good, unto the resurrection of life; and they that have done evil, unto the resurrection of judgment [damnation—KJV]” (John 5:28-29). “But this I confess unto you, that after the Way which they call a sect, so serve I the God of our fathers, believing all things which are according to the law, and which are written in the prophets; having hope toward God, which these also themselves look for, that there shall be a resurrection both of the just and unjust” (Acts 24:14-15). “The sea gave up the dead that were in it; and death and Hades gave up the dead that were in them: and they were judged every man according to their works” (Rev. 20:13). “And be not afraid of them that kill the body, but are not able to kill the soul: but rather fear him who is able to destroy both soul and body in hell” (Matt. 10:28). Resurrection is the rising up of that which has been laid down. The body that dies and is laid to rest (or burned, drowned, etc.) will be caused to stand up again. The Bible teaches that the resurrected body will be a different essence (1 Corinthians 15:42) of the individual's presence. The seed (e.g., "body") is planted in the ground. The plant that rises (e.g. "the resurrected body") is from the seed, but different than the seed. Two points are important to keep in mind. 1. First, each body will retain its own individuality (“each seed a body of its own” — 1 Cor. 15:38). Back to John Battaglia and his execution. He shouldn't have been smiling. He should have been trembling. He shouldn't have welcomed death. He should have feared it deeply. "For it is a fearful thing to fall into the hands of the living God” (Hebrews 10:31). I believe the Bible clearly teaches that the wicked do not live forever. I also believe the Bible clearly teaches that at the end of God's judgment against the wicked there is death again (e.g., "The second death."). However, I believe the Bible teaches that the wicked should tremble...tremble...tremble... at the coming Judgement. Why do I not tremble? You should have trembled, John Battaglia. You should have trembled. It is most obvious that sinful humans are in desperate need of an example ... a person we can identify with ... who represents the standard of how mankind should live. And, since the fall, there hasn't been a man born by natural generation who came anywhere near that. So, we need Jesus to set the standard for us. It is in the nature of sinful man to compare how he sees himself to how he sees others. Battaglia could easily have thought of Stalin or Hitler or Caligula, and thought himself good enough. We cannot be good enough but, thank goodness, He Himself told us how we can be judged righteous in God's sight. And He even told us how we could lead a life here that exceeds, by far, anything our natural selves could hope for. I wish the demon, John Battaglia, would have experienced more physical and mental pain than going to sleep. However, I’m sure Hell will accomplish that. He went out of his way to make you feel good. He gave us the world’s greatest sermon; a Good Example. He was a man that had discovered the peace that is found in Jesus. He knew who he was, what his job was, where he came from, where he was going, and how to get there. Bud was our community’s role model. He always gave more than his share. At church or in the field, his wife was usually by his side. Those poor daughters! Shot so many times by their own father. And the mother unable to reach and help them. Some things in this world are so unbearably sad. Judy said she remembered these horrible murders when they happened. Battaglia was an ex-Marine who worked as an accountant. He had a daughter from a previous marriage. He had committed domestic violence against his first wife. His second ex-wife, Mary Jean Pearle, resided in Highland Park, Texas, in the Dallas-Fort Worth metroplex. His two daughters with Pearle, Faith (age 9) and Liberty (age 6), were students at John S. Bradfield Elementary School in Highland Park. At the time of the killings, [May 2, 2001] Battaglia was on probation for hitting Pearle. She was attempting to get his parole revoked, saying that he was harassing her over the telephone and that he should be placed in jail because of his history of domestic violence. Wade, something’s wrong with our laws that let this guy live 17 years. Wonder if the parole board ever apologize? My brother’s letter is in our church history. Wow. Such evil. I have no idea why his execution took so long. Your brother’s letter is quite interesting. Perhaps Ezekiel 18 is an applicable chapter concerning the Second Death, particularly from verse 21. Physical death is not what we should fear, but the second death is what we should fear. To say that we should fear death is ambiguous. What you meant when you were referring to being fearful death was being fearful of the second death but did not qualify which death you were referring too. At the "first death" you fall into the hands of the Living God (Hebrews). At the Judgment (which is "handled" by God) and where every thought, action, word, and deed are weighed and examined in the scales of God's justice, every person "must give an account" (Romans). The ultimate consequence of this Judgment is being sentenced to the second death by God. How long before the implementation of the sentence, what happens between the sentence and the execution, and how that process unfolds seems to me to be in the hands of the righteous Judge and would only be speculation by the rest of us. The "every person" in the preceding comment (end of the second paragraph) is every person "outside of Christ." Jesus Christ has already answered for those "in Him" and the verdict is "righteous." Is this the context of what you are saying? Receive one who is weak in the faith, but not to disputes over doubtful things. For one believes he may eat all things, but he who is weak eats only vegetables. Let not him who eats despise him who does not eat and let not him who does not eat judge him who eats; for God has received him. Who are you to judge another's servant? To his own master he stands or falls. Indeed, he will be made to stand, for God is able to make him stand. So then each of us shall give account of himself to God. Therefore let us not judge one another anymore, but rather resolve this, not to put a stumbling block or a cause to fall in our brother's way. Will Christians Stand Before the Judgment Seat? The text commences with a question... "Why dost thou judge thy brother?" This is an appropriate question to ask ourselves. Why do we judge other Christians? Why do we think a Christian is lazy, unspiritual, or weak and "set them at naught"? "For God hath received him" (v.3). "God is able to make him stand" (v.4). This is the doctrine of "justification by faith." A sinner is made right with God by the righteousness of Christ, "reckoned," "accounted," or "credited" to him. The righteousness of God is "imputed" to me by faith, not "infused" in me. We all stand before Christ. "We shall all stand before the (judgment) seat of Christ" (Romans 14:10). The word "bema" is translated "judgment seat," but the word judgment is not in the Greek word. It literally means "podium" or "throne." It is translated this way in Nehemiah 8:4 where Nehemiah "stood on a pulpit of wood (bema)" to read the Word of God to the people of Israel. It is an elevated position of authority. We "Christians" all stand beside Christ. The ungodly shall not stand (Psalm 1:5). The text continues with a quotation... "For it is written..." (v.12). Verse 12 is a direct quotation from Isaiah 45:22-25. In this text, God swears an oath. "As I live..." (v.12) "I have sworn by myself" (Isaiah 45:22). What does God swear? "That every tongue shall swear" (Isaiah 45:23) this word "swear" is also "confess." "In the Lord alone there is righteousness and strength." In other words, when we stand before God on that day to come, those who swear, "I have no righteousness but this" shall stand beside Christ. All those that are"incensed" at him shall be "ashamed" (Isaiah 45:25) and shall be judged by Him. The text concludes with a quest... "Every one of us shall give account" (v.12). The person who has been angry with Christ on earth shall find God angry with him in heaven. This sinner will be judged according to his deeds on earth (Romans 2:6). The word account is the Greek word logos. It is the same word used by John to describe the coming of Christ to earth, "In the beginning was the Word (logos), and the Word (logos) was with God, and the Word (logos) was God" (John 1:1). It is also used 11 times in its verb form in Romans 4 to describe the action of God reckoning or crediting righteousness to the believing sinner. The quest to find the books that give an account of our lives will end with an examination of His books (John 20:25). That verse used to worry me in my belief of “Once saved; always saved”. My worries stopped when I realized what the words “do you suppose” or “do you think” really mean. They don’t mean could happen, or will happen. It’s like saying, “Of how much worse punishment, do you suppose, will he be thought worthy who has” killed all the children in the world. Google referred me to “Istoria Ministries Blog” which had: “The Veil of Moses Hides a Fading Glory” with Scripture reference 1 Corinthians 3:18”. It was posted December 20, 2009”. Sad news: Frances Ray (in her 90’s) has pneumonia and is on Hospice. She was a missionary to Korea for 39 years with her husband Dan who was buried ½ a mile from here seven years ago. Thanks for the correction of the Typo! :) Done! so God is just gonna kill John Battaglia again,,, doesn't seem like much of a punishment ... but I'm not God.. It seems like the Bible states that John will be raised from the dead to give an account to God for how he lived his life, then God will sentence John to an extended period of isolated existence outside of the mercies of God that John experienced in his first life, ultimately ending in what the Bible calls John's second death. thanks for your response and your blog. It is really well done. You said, , "then God will sentence John to an extended period of isolated existence outside of the mercies of God that John experienced in his first life,ultimately ending in what the Bible calls John's second death. " -where in the Bible can this be found. - Does this occur after the resurrection of the dead? -how will God kill John the second time. Thank you for your time. I really enjoy hearing you preach, as well. I hope things are going well in Oklahoma . Jamie, most of your questions can be answered by following this debate (from November). I think you'll find it interesting and worth your time. I would encourage you to search the Scriptures for yourself and hold to what the Bible teaches about the questions you are asking. Today I visited Francis, or I should say her son, Mark, his wife, and Marie the wife of a son, Andy. A while back, three of us had loaded a lift chair in a truck. Andy, by himself, had picked it up and carried it into the building. I was told Francis was in a coma and medication kept her from pain. I had pictured her lying in a peaceful sleep, but it was not the case. Her eyes were closed but her mouth stayed open and every breath made a noise. Her body hardly ever stopped moving. I had a choice of crying or talking of old times. Her so, Mark, had retired as a missionary in Australia. I asked Mark if he remembered saying to his brother, “Get him Andy! He did not. In a flash, Andy jerked my leg up so high I hit the ground flat on my back. From then on story after story was told. It's cool that a machine pointed my Texas friend to my blog - a machine who almost lost her voice! :) (You had to have watched the Super Bowl commercials to understand that one). But in re-reading your comment you asked GOOGLE, not ALEXIS. So I'm sorry for the misunderstanding. You GOOGLED your question - "I ASKED Google..." is what threw me off. I didn’t see any commercials on the Super Bowl. I record football games and watch them later. This makes it possible to watch a game in about one fourth the time. At anytime you can stop, back up 10 seconds with each push of a button, or jump forward 30 seconds each time you push a button. (After a play stops, it usually takes about 35 seconds before another starts.) What is really great is at anytime you can watch in ‘slow motion’ as many times as you want. I usually start watching about 30 minutes after a game starts, and when I catch up to ‘live’, I could watch other recorded shows like “Andy Griffin” or “ Monk”. I try to time it so the last few minutes are ‘live’. The Battaglia case raises a terribly difficult problem for Christians. This man was clearly mentally ill. How does your theology accommodate a case like this? Battaglia was found to not be mentally ill at all. And even if he had been insane, that would in no way lessen his moral guilt and responsibility in murdering these children. There should be no such thing as “not guilty by reason of insanity” in criminal law.